Organic anti aging face oil for Combination skin. Sensitive skin & eczema. If your have combination skin a common mistake is to use a product that dehydrates the skin, like harsh cleansers or astringents containing alcohol. This strips the skin of its oils and just encourages it to produce more oil to compensate. The key is in providing nourishment and hydration without clogging the pores and in rebalancing the sebum production. 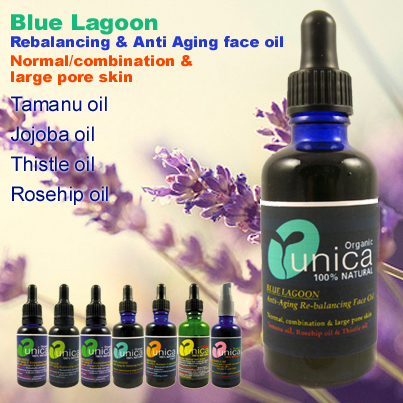 Unica Blue lagoon light non-comedogenic oil blend does just that: Jojoba oil and Rosehip oil nourish, sooth and rebalance the skin; Thistle oil helps to reduce the size of pores and its composition makes it particularly suitable for oily and acne prone skin; Tamanu oil, the “miracle oil”, is invaluable for its amazing regenerating, rebalancing and antibacterial properties . The anti-inflammatory and bactericide properties of essential oils greatly help the healing process. In Blue Lagoon organic face oil, all these natural ingredients work in perfect unison to clear and rebalance congested, combination and oily skin. Blue Lagoon is quickly absorbed by the skin without leaving any greasy residue. SKIN TYPES: Normal to combination and large pore skin. Also skin affected by sun exposure, chemotherapy and radiotherapy. Blue Lagoon organic face oil also helps to reduce pigmentation marks and scars. USE: Apply 1-2 drops to face and neck and massage into skin. For a lighter silky feel apply on damp skin, moisten with Pura Lavender or Rose toner. 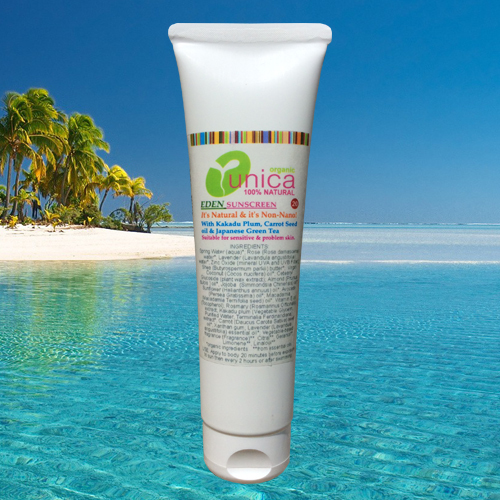 When needed, you can also add 2-3 drops of Blue Lagoon organic face oil to your Unica cream for an even deeper nourishing and moisturizing action. Do not use if you have a nut allergy. Pregnant and breastfeeding women should consult the doctor before using this product. STORAGE: Cool place away from direct sunlight. As well as being one of the best anti-wrinkle oils available today, Rosehip oil is excellent for treating sensitive and oily skin, skin with large pores as well as helping to treat all kinds of skin infections, such as acne, eczema, psoriasis, pimples and boils. Rosehip is amongst the best vegetable oil source of omega 3 and is also a good source of omega 6, involved in cellular membrane and tissue regeneration and normalising skin with large pores. Jojoba oil is a must in the treatment of acne and oily skin because it “tricks” the skin into stopping the over-production of sebum through somehow mimicking sebum and also assisting in the breakdown of sebum in plugged-up pores. Sebum and jojoba oil mix readily without sealing off the skin pores. In short, jojoba oil helps to balance sebum in all skin types, helping to moisturize dry skin in some people or balancing the over-abundance of oil in others. it is also a great oil for sensitive skin, which has been used to treat eczema and psoriasis with good results. If there is such a thing as miracle oil, Tamanu oil is THE miracle oil. Tamanu oil is an excellent example of a traditional remedy which has come to broader attention due to a combination of effective use in traditional setting and scientific research corroborating its benefits. It is an excellent choice for oily and acne prone skin because of its antibacterial properties and because though it is a thick and rich oil, once it is applied to skin it is readily and completely absorbed, leaving the skin with a healthy glow with no oily residue..Tamanu is a unique oil that is known for its amazing ability to speed the healing process and to promote the growth of new, healthy skin tissue. It is renowned by native Tahitians as a 'sacred oil' that has been used for centuries to heal a variety of ailments not limited to skin issues. In Fiji, it is even used for relieving pain associated with a variety of ailments like shingles, neuralgia, and rheumatism. Tamanu has a distinctive composition of lipids and possesses natural antineuralgic, anti-inflammatory, antibacterial and anti-fungal properties, antibiotic, antioxidant, and anti-aging properties. Thistle oil is an excellent source or omega 6 & 3 essential fatty acids (also known as vitamin F), as they can make up over 80% of the oil content. Of all the vegetable oils, thistle oil has, in fact, the highest content of linoleic acid, an omega 6 essential fatty acid. This makes it easy for the skin to absorb and it is a versative oil that can be used in all kinds of skin care products due to the high vitamin F content. Although suitable fot al skin types, thistle oil is particularly good for use on aoily, large-pored or acne-prone skin. The Aborigines have been using this indigenous Australian tree in their medications for centuries and today tea tree is the subject of a great deal of international research. Its impressive anti-viral, anti-bacterial and anti-fungal properties make it useful in a wide range of conditions. When used in products for oily skin, Tee Tree oil dissolves skin oils and kills bacteria. Lavender oil is a natural antibiotic, antiseptic which prevent scarring and promotes healing by stimulating the cells of a wound to regenerate more quickly. Lavender normalizes facial and scalp oils and kills bacteria and because of these properties has traditionally been used to keep skin clean and clear . It also has a multitude of other qualities which make it a truly indispensable oil.